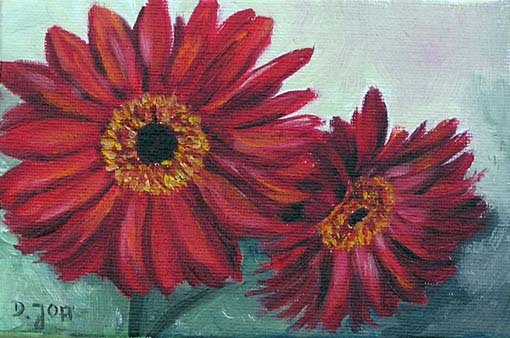 Two red Daisies and one old rose, small paintings 4×6"
I have not posted very much on my blog in the past days. I am very busy at this time with working again on my website. I will offer on my website also prints, greeting cards, free wallpapers etc. 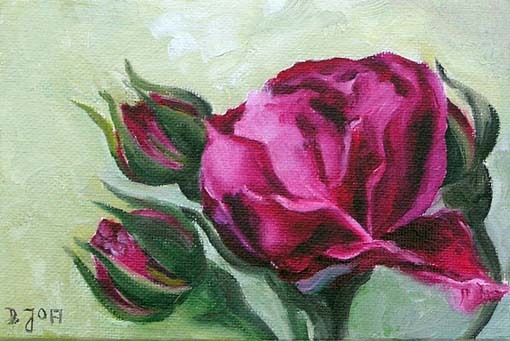 I also want to add my step-by-step-demo of the rose painting there, so that it is easier to see all together. But this all needs much work and my computer is not the fastest. Also I must set up two websites, one in german language and the other in english. This means more work, so I did not find time for posting here. But I had now enough with all the computerwork and today I wanted to paint a bit. So I did two small paintings in oil, the size of each is 4″x6″ (10×15 cm). One is an old rose and the other shows two red Daisies. I have put them on ebay with a low starting price without reserve, so if you are interested to bid, simply click here for the daisies and here for the rose.